Despite its name, the Great Dane is in fact a German breed. Originally used to hunt wild boar, it was once classified as a hound. Today it is kept solely as an extremely large, gentle companion. Dogs very like today’s Great Dane have been around for at least 400 years. Some sources list it as the descendant of the now extinct Alaunt and of having existed in ancient Egypt, Greece and Rome. Other sources say that it was developed from a medieval boarhound that was crossed with the Mastiff and the Irish Wolfhound. 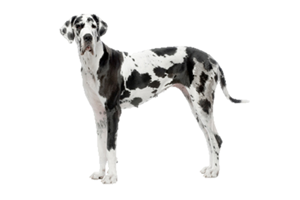 The Great Dane has been recognized as the national dog of Germany since 1876. Is the Great Dane Right for You?